In yesterday’s blog, I encouraged you to add new culinary experiences to your life with the aim to create healthy eating habits that are fun to keep up. Going crazy with spices is one great way of doing this. Now I want to challenge you to go beyond your food: spice up your life in general by adding new, adventurous or even thrilling experiences! Getting out of your routine, stretching and challenging yourself will give your happiness a boost, it will give you a sense of satisfaction and the feeling of being truly alive. Have your adrenaline spike for a good reason. This can put your day to day stress situations into perspective and help you to better handle the things that don’t really require you to fight or run. Not everyone feels thrilled or excited by the same things, make a bucket list of things for yourself and things you can do with your partner, your kids, your friends. Think roller coasters (or other fun fair rides, that seem too fast or too crazy), rock climbing, jumping form a 5 meter jumping board (for me the 1 meter board would probably do it :-)) or an activity parkour in the trees. And you never know, you might discover a new passion or something really surprising on the way. Yesterday, I decided to jump in the pool we’ve set up on our terrace together with my kids. They love the water, I don’t. I’ve only taken them swimming in heated pools. They know that for me to go into the water, I want at least 29°C. Our little pool was at 23°C yesterday. For many of you this will not sound like a challenge at all, well, for me it was. 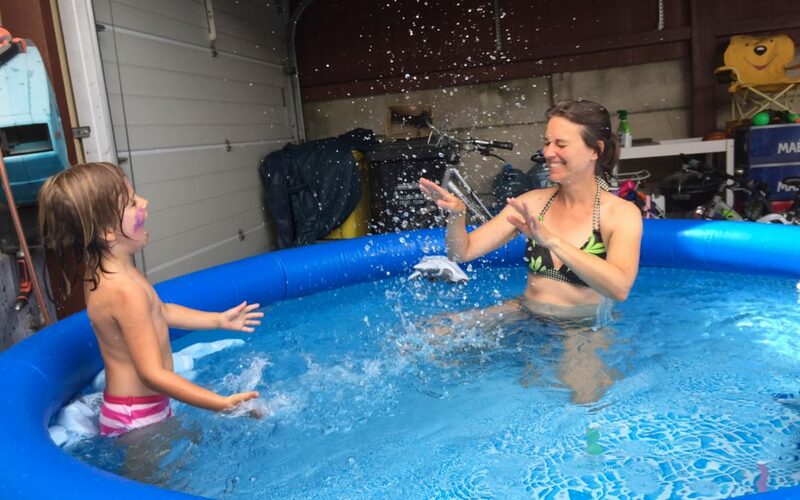 I came down the ladder slowly and when my daughter started splashing me with the cold water, I decided to let myself drop to the bottom quickly. I expected to want to come out of the water immediately but to my surprise, I realised that I was ok. I stayed in the pool for a while, splashing, having my kids dive between my legs and playing with a beach ball. So even though I did not get the expected thrill, we all had fun we would not have had, had I not decided to take the plunge. I’m a curious person by nature, so what happened? Why did I not get the thrill that I expected? Well, probably for the same reason that many of you would not find jumping into water at 23°C challenging. It’s supposed to be ok. The fact that it was not ok for me in the past was most likely due to my sluggish thyroid gland. Among other very important jobs, the thyroid works as our thermostat. I used to the person wearing socks to bed, putting on a second jumper when others were still comfortable in a t-shirt and walking bare-feet on tiled floors felt super uncomfortable (I had to really pull myself together to allow my kids to run around bare-feet in our house). The changes I made to my eating plan and lifestyle in general have not only had me lose weight, they also gave my hormonal system a good boost. I feel the differences in my mood, my energy and clarity of mind. I was not so aware of the better temperature regulation, so there is another bonus for me :-). Open a note on your smart phone and start your bucket list of boundary expanding activities to spice up your life. By creating this list on your phone, you can always add to it. My tip for the list is Disneyland Paris: Armageddon* for the thrill and Ratatouille for a really good laugh.